In this clip from the morning of October 19, 1962, at the height of the Cuban Missile Crisis, General Curtis LeMay, Air Force Chief of Staff and head of the Strategic Air Command, challenges the idea of the naval quarantine. Instead, he recommends more forceful military action against the Soviet bases in Cuba. LeMay compared the blockade option with appeasement at Munich, a particularly potent charge to Kennedy given Joseph Kennedy’s position on the matter while he was Ambassador to the United Kingdom. He also disagreed with President Kennedy’s view that military action against the bases in Cuba would invite Soviet reprisals against West Berlin. 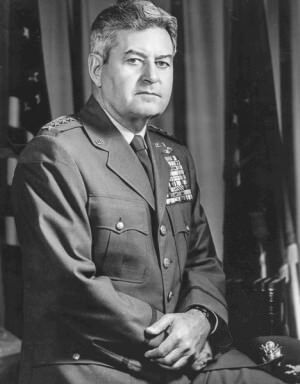 Curtis LeMay Now, as for the Berlin situation, I don’t share your view that if we knock off Cuba, they’re going to knock off Berlin. We’ve got the Berlin problem staring us in the face anyway. If we don’t do anything to Cuba, then they’re going to push on Berlin and push real hard because they’ve got us on the run. If we take military action against Cuba, then I think that the . . .
JFK What do you think their reprisal would be? LeMay I don’t think they’re going to make any reprisal if we tell them that the Berlin situation is just like it’s always been. If they make a move we’re going to fight. Now I don’t think this changes the Berlin situation at all, except you’ve got to make one more statement on it. So I see no other solution. This blockade and political action, I see leading into war. I don’t see any other solution for it. It will lead right into war. This is almost as bad as the appeasement at Munich. [Pause.] Because if this [unclear] blockade comes along, their MiGs are going to fly. The IL-28s are going to fly against us. And we’re just going to gradually drift into a war under conditions that are at great disadvantage to us, with missiles staring us in the face, that can knock out our airfields in the southeastern portion [of the United States]. And if they use nuclear weapons, it’s the population down there. We just drift into a war under conditions that we don’t like. I just don’t see any other solution except direct military intervention right now. Transcript originally published in Timothy Naftali and Philip Zelikow, eds., The Presidential Recordings: John F. Kennedy, vol. 2 (New York: W.W. Norton, 2001) pp.583-84.